How did he miss from there? Who said the players were taking it easy? The final siren sounds with Adelaide far too good for Carlton in the final quarter. They ran out very impressive 38 point winners. On the other hand, Adelaide could be set for a big season after their two very impressive NAB Challenge matches this year. Carlton must be concerned with the last quarter fade outs with both of their NAB Challenge matches seeing them struggle. BEHIND CROWSEllis-Yolmen with a set shot at goal from 35 metres out, but his shot hits the post. GOAL BLUESThompson runs deep in defence and tries to get the handball out. He trips and loses the ball. Ellard is adding sugar to his coffee before the ball drops in his lap and he kicks the goal. GOAL CROWSJenkins just inside 50. How is the kick? The kick is a beauty! 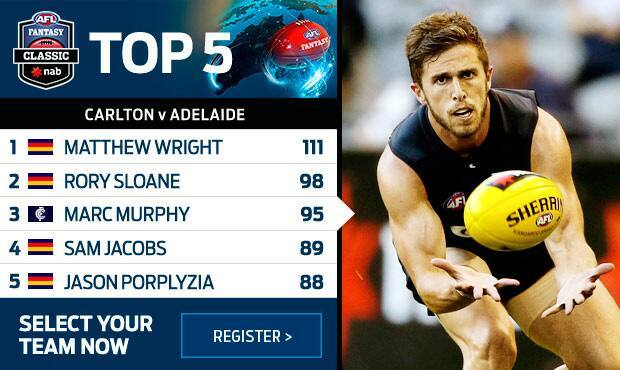 What a choice of forwards the Crows have at their disposal. Tonight only saw half of them. GOAL CROWSAdelaide are doing as they please here in the final quarter. Sloane is isolated against Bootsma. He takes him on, marks and runs off him to kick the goal. GOAL CROWSPetrenko roves the ball from the stoppage and runs away from goal. He kicks what can be described as a reverse banana apple kick! My word, what a goal! Crows running amok. BEHIND CROWSJenkins with a golden chance to seal the deal for the Crows but he tries to be fancy and the ball rolls into the post. The Crows have raced out to a 23 point lead with Carlton not really looking like they have another effort to raise tonight. GOAL CROWSThe ball is pumped deep inside Adelaide's 50. Dangerfield pounces on the crumbs and he is danger by name and danger by nature! Dangerfield snaps it through. Waite, Gibbs and Yarran have pulled up stumps for the night and head off for an early shower. The Crows are definitely working harder here and the Blues just can't get the footy inside their 50. BEHIND CROWSMcKay tries to bend it back with the outside of his boot under pressure. It's bending but needs to bend more than that. BEHIND BLUESKreuzer to Everitt to Ellard who tries to screw it around and it's only a minor score. BEHIND CROWSJenkins kicks it through traffic and it slams into the post. BEHIND CROWSLyons from a standing start, but his shot is across the face for a behind. GOAL CROWSDangerfield launches from 55 metres out. Thompson does the body work near the goal square and it bounces through for a SUPER GOAL! The Crows look to be going a bit harder in the early stages of the final quarter. BEHIND CROWSWright's long shot at goal straightens up and looks good. It looks good until Wood is allowed to touch it on the line. GOAL CROWSMcKernan is really making tonight count. The ball is loose inside 50 with McKernan going off the carpet with the outside of his boot. It's rolling, rolling and rolling through for a goal. The siren sounds for three quarter time with Carlton holding a one point lead. GOAL CROWSThe Crows strike back. Jenkins is thrown out of the marking contest and if that's not a free kick then I am not here! Jenkins with a glorious kick from 45 metres. It's a one point game! GOAL BLUESEllard is closest to the boundary as the free kick is paid for deliberate. There is no banana or side step kick in sight. A deliberate drop kick that goes straight through! 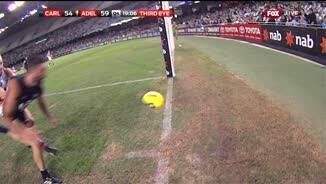 The umpires have been strict with the deliberate out of bounds rule tonight. Once again it's tough contested footy out there with kicks earning you a bruise. GOAL BLUESCarlton make it two in a row to take the lead. Everitt is clever to kick it off the ground from 20 metres out for a goal. GOAL BLUESCarlton have an open forward line here. Where is Garlett. There he is taking the mark. He sees Scotland ahead and sends it down his throat. Scotland squeezes the kick through. The Carlton coaching box has a new face in it with Dean Laidley sitting front and centre. Some frustrated Blues fans out there with the Crows slowly gaining control in the third quarter. GOAL CROWSThe Crows move the ball efficiently. Rutten makes the big run from full back to full forward and he takes the mark. He thinks about playing on but doesn't then splits the middle. Dale Thomas has been lively in his first Carlton appearance with 13 disposals. BEHIND CROWSCrouch with a wonderful tackle on Everitt. GONE! From 45 metres out he lines it up. It starts on the post then moves left. 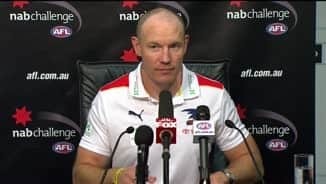 GOAL CROWSShaun McKernan is making a statement to the Crows and the 17 other clubs that didn't deem him worthy of a trade. He leaps up to take the mark. His shot at goal is even better. Grigg comes in off the bench and cops a solid bump from Daisy Thomas who shows commitment to the cause. Heath Scotland has been lively since coming on after halftime. BEHIND BLUESBuckley's shot at goal is touched on the line. GOAL CROWSShaun McKernan has moved forward after coming on as substitute late in the second quarter. He comes out on the lead and marks then sends it over the goal umpire. BEHIND CROWSOnce again Adelaide get the first score for the quarter and it's a behind to Porplyzia. The siren sounds for halftime with Carlton once again leading by 8 points. GOAL BLUESIt has taken more than 15 minutes since the last score but Casboult handballs to Garlett and they won't catch him. He bolts away and kicks the goal. McKernan is on the field for Adelaide as substitute. Douglas is ridden into the ground by Menzel with no free kick forthcoming. The players have a not so friendly gathering with the Crows players not so happy. We have not had a score in this match for over ten minutes. Kreuzer juggles the ball with his hand punched in the contest but play on is called after Kreuzer fails to control the ball. The Carlton fans are a little restless with the scoring not as free flowing as they would like. The gaps have been closed with the space drying up. Carlton have players behind the ball and kicks are not easy to come by. 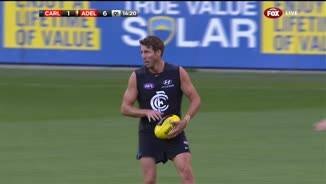 Cripps has come on as one of Carlton's substitutes. Carlton fans will be nervously watching Bryce Gibbs hoping he commits to the club beyond this season rather than possibly playing for tonight's opposition in 2015. BEHIND BLUESA rushed behind to the Blues doubles their lead out to 2 points. The second quarter has been more free flowing than the first but it's tightened up of late. GOAL CROWSAdelaide surge forward with Douglas gathering with his back to goal. He knows where the goals are. One of the best in the business! 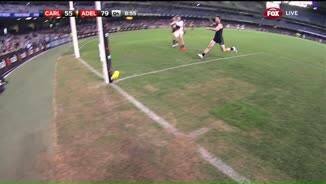 GOAL BLUESMenzel gets underneath the ball, then is dangerously pushed in the back in front of the umpires. The free kick is paid and Menzel has a beautiful kick. This is no exception. GOAL CROWSOtten comes in from the side to mark out in front of Watson. That almost looked easy! The shot of goal is absolutely no worries. It's a goal for the Crows. The Crows have started the second quarter full of run. GOAL CROWSOtten does the ball extraction work before providing the assist by way of handball to Porplyzia who takes care of business and kicks the goal. GOAL BLUESEllard cannot take the mark, but he butters up and chases his own ball. He gets it and spins around, fends off his own teammate and kicks the goal. What an effort! BEHIND CROWSDangerfield marks 30 metres out. His shot at goal is touched off the boot and it's only a behind. The siren sounds for quarter time with Carlton leading by 8 points. BEHIND CROWSPorplyzia is paid the free kick for a throw out of defence by the Blues. Porplyzia is unable to make them pay for it with his shot lucky to sneak in for a behind. BEHIND BLUESCameron Wood lets fly from just inside 50 but his shot also misses to the left. BEHIND BLUESBell tries one from distance but he misses to the right. GOAL BLUESCarlton make it two in a row after Casboult uses his strength to edge out his opponent to take the mark. From 15 metres out, Casboult makes no mistake. Carlton have begun to lift their game after a slow start to this first quarter. GOAL BLUESCurnow with some good forward defensive pressure wraps up Ellis-Yolmen with a tackle he just couldn't break. Holding the ball! Curnow kicks it to perfection. Goal! BEHIND CROWSThe ball is pumped deep inside 50 but Rowe is there to punch it through for a behind. Both sides getting a decent run around with hard work the order to get a disposal. The Crows are in a white strip for tonight's NAB Challenge match. It's been a rather scrappy start to the game with tight contested football the name of the game. BEHIND BLUESMurphy spins around and throws it onto his boot, but the ball bounces to the wrong side of the post. Last week's goal kicking hero and former Blue, Eddie Betts is not playing for the Crows tonight. Carlton have players behind the ball at the moment and are running in numbers. A small crowd is in attendance tonight with it being a school night. Tom Bell looks to have spent a lot of time in the gym over summer. The Carlton fans cheer with Thomas getting his first kick for the Blues. GOAL CROWSAdelaide make a big statement with a quick start. Ruckman to rover to full forward. The full forward being Podsiadly who marks it out in front of him and slots it through. We are off and underway at Etihad Stadium. Welcome to Etihad Stadium for the match between Carlton and Adelaide. 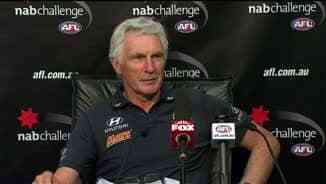 For Carlton fans it is the moment that they have been waiting for, the unveiling of recruit Dale Thomas. PRIZED Carlton recruit Dale Thomas has dispelled any doubts about his fitness with a polished performance in Monday night's NAB Challenge clash against Adelaide at Etihad Stadium. Thomas, who missed the Blues' opening pre-season game because of a chest infection, played a full match and won 18 possessions, mostly in the first half, to play a lead role against the Crows and set himself for round one. The performance suggested the 26-year-old, who crossed from Collingwood at the end of last season as a free agent, was clear of the ankle problems that have troubled him over the past two years. While the return of Thomas was the most significant storyline on Monday night, Adelaide was the more impressive of the two teams, breaking away in the final term to win by 38 points: 1.13.12 (99) to 0.9.7 (61). 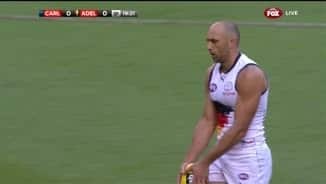 With Carlton resting Chris Yarran in the fourth quarter, as well as substitutes Jarrad Waite and Bryce Gibbs to effectively play one man down, the Crows kicked six unanswered goals to blow the game open. Key forwards Josh Jenkins and Shaun McKernan combined to kick five second-half goals, while midfielders Matthew Wright, Richard Douglas and Rory Sloane were influential. McKernan was particularly impressive as he hit packs strongly, recovered well at ground level and kicked truly. Thomas started deep in the forward line but had licence to push up the ground, winning his first touch at half-back and roaming the wing opposed to Luke Brown and Sam Kerridge. Rotated heavily through the first quarter, his kicking became more polished and he was typically strong in the air. 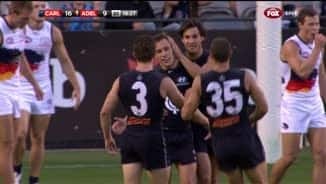 In a scrappy, physical pre-season game, captain Marc Murphy (30 possessions) was at the forefront for the Blues, while Gibbs started strong before being substituted at three-quarter time. Adelaide star Patrick Dangerfield spent much of the contest playing as a deep forward, opposed to Yarran, entering half-time with just five touches to his name. He lifted in the final quarter, however, kicking brilliant back-to-back goals, including the only supergoal of the match, to spark the Crows' surge to victory. Carlton: The Blues' final practice match, against the Western Bulldogs, takes on increased importance after the team's fourth-quarter fade out. Along with Thomas, Kade Simpson, Heath Scotland, Michael Jamison, Jeff Garlett and Matthew Kreuzer were all playing their first pre-season matches, and they fell off the pace in the final term. Carlton has 11 days to prepare for its final hit-out. Adelaide: It's a big year for Shaun McKernan and Josh Jenkins. The two key forwards were outstanding in patches on Monday night and the Crows will be relying on them to provide strong targets while Taylor Walker is eased back. With James Podsiadly in the mix, there is a selection squeeze building in the key forward posts. 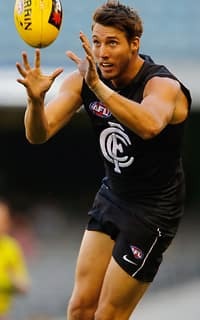 Carlton: Dale Thomas was an immediate fan favourite in navy blue, earning applause when he won his first possession after two minutes on the half-back line. Carlton's first selection at the 2013 NAB AFL Draft, Patrick Cripps, was also impressive, entering the game late in the second quarter and showing plenty of class with the ball. Former Sydney Swans forward Andrejs Everitt followed up his excellent first game for Carlton by working up the ground to finish with 19 possessions and six inside 50s. 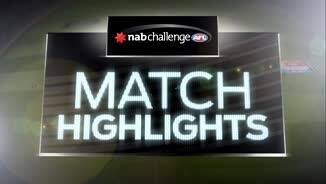 Adelaide: Matt Crouch backed up his impressive opening NAB Challenge effort with 15 possessions and three clearances, while James Podsiadly spent significant time in the green vest, kicking one goal and finishing with just three possessions. Cam Ellis-Yolmen has spent two seasons on the Crows' list but is yet to play a senior game That should change this year based on his gritty midfield effort against the Blues.